Orlando, Fla. Pulse survivors in Boston. Mesha Caldwell, 41 years old. Jamie Lee Wounded Arrow, 28. JoJo Striker, 23. Keke ­Collier, 24. Chyna Gibson, 31. Ciara McElveen, 21. Jaquarrius Holland, 18. Alphonza Watson, 38. Chay Reed, 29. Mx. Bostick, 59. Sherrell Faulkner, 46. Kenne McFadden, 27. Presente! Bigger-than-life photos of the 12 trans people of color reported murdered so far in the U.S. in 2017 were hoisted as their names were shouted out to a crowd of thousands during a coordinated disruption of the Boston Pride Parade on June 10. The disruption was planned by groups that included the Network/La Red, Stonewall Warriors, Workers World Party, National Lawyers Guild and others. Activists at the front of the march risked arrest to confront spectators with reminders of the staggering rate of violence that trans women of color face. 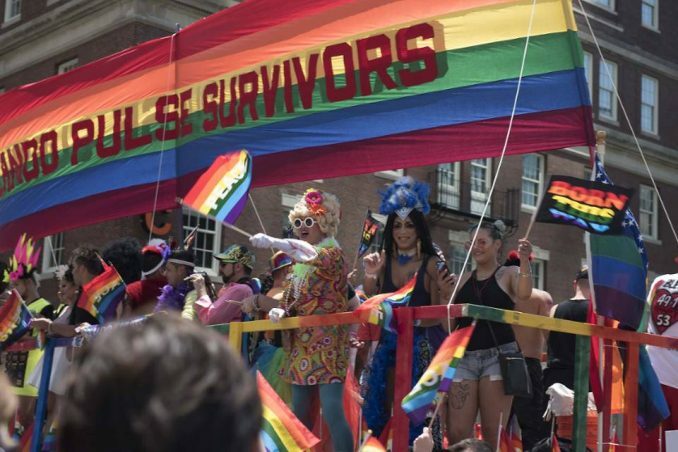 Stonewall Warriors and WWP organizers also created space, under the umbrella of a “QTPoC Liberation/Anti-Capitalist Contingent,” for broad multinational, multigenerational participation in the Boston Pride Parade. 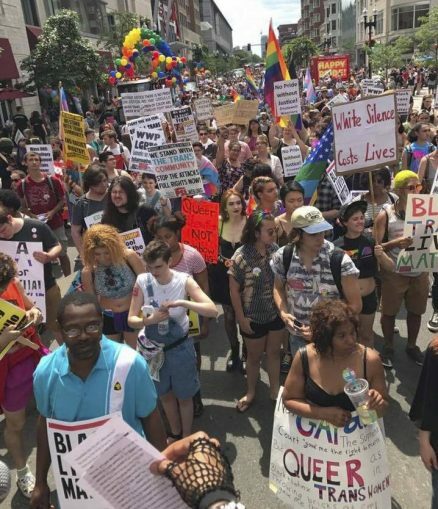 The outspoken revolutionary youth who joined Stonewall Warriors to help organize the contingent drafted a call for an anti-racist, anti-capitalist protest at the 2017 Boston Pride Parade. Their leaflet identified four demands designed to honor “the riot that made the parade” — the historic Stonewall Rebellion of June 1969 in New York City. Out of that uprising, trans leaders Sylvia Rivera and Marsha P. Johnson (whose pictures were carried along with those murdered in 2017) created living connections to other historic liberation movements of the time: the Black Power struggle, the Puerto Rican anti-colonial movement, the Native peoples’ uprising, the women’s movement and the upsurge against the Vietnam War. In the spirit of the example set by Rivera and Johnson, Stonewall Warriors’ four demands called for official 2017 Pride events to stop sidelining radical and revolutionary Black community participation; for Pride to officially speak out against the rash of recent trans murders; for an end to Pride’s lucrative sponsorships from companies that profit off prisons, colonial debt and desecration of Native land; and for a ban on all police and Immigration and Customs Enforcement agents at Pride events. Hundreds of people of trans, queer, enby, intersex, two-spirit, pansexual, disabled, ace, bisexual and other identities answered that call and turned out ready to take to the streets on June 10. Diva T. Williams, one of the group’s key organizers, emceed a spirited and combative march that delivered on the promise of a genuine alternative to the increasingly corporate annual Pride event. Armed with militant determination to return Pride to its roots as a political force for advancing struggles of the most marginalized, Williams and others led the crowd in chants calling for an end to solitary confinement for incarcerated trans people, housing for LGBTQ youth and an end to both the deportations of immigrant Black and Brown people and the murders of trans women of color. 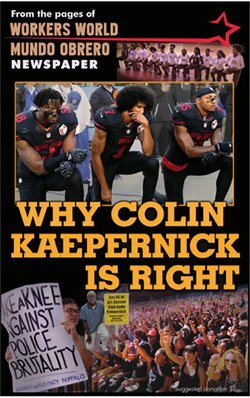 As the train of protest wound its way through Boston streets, the marchers encouraged spectators to consider that the logo-branded trinkets handed out by the banks and corporations represented oil money, violations of Native sovereignty and prisons for profit — not Pride. “Put it in the trash!” marchers urged spectators. Cheers erupted when a parade-watcher threw her Bank of America plastic fan in a garbage can.